Each year since 1997, Lester Pearson College has facilitated the Christmas Bird Count at Race Rocks . This year we established a new record for the distribution of the Boreal Owl in British Columbia. Below is the account of the event from the Race Rocks website. “December 28, 2014– Val George and myself were picked up at Pedder Bay By Alex Fletcher, (Ecoguardian at Race Rocks) and we went out to Race Rocks for the Sooke area Christmas Bird Count. It was a great day with many high counts , but we were especially surprized to flush a small owl out from under a rock up near the camera 5 pedestal. At first Val thought it just could be a Boreal owl (Aegolius funereus) which would be a first for this area. We found it again under the porch of the Ecoguardians house and were able to get some good pictures of it. 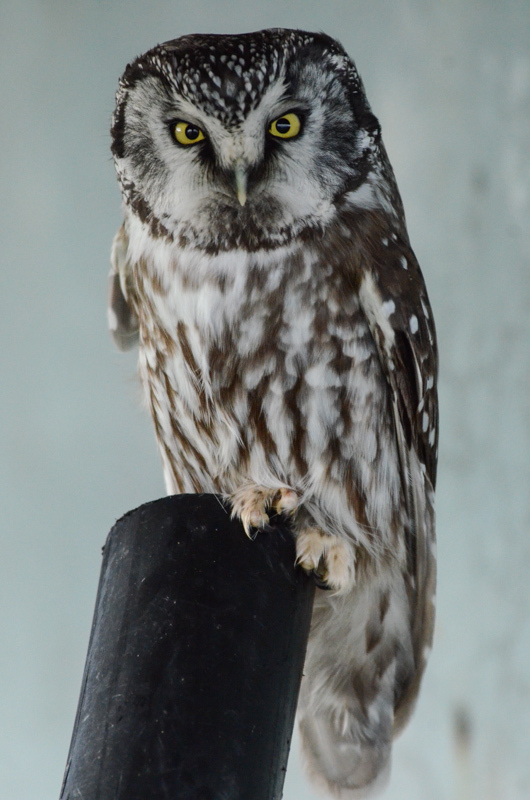 Then we decided it must be a Saw whet owl as Boreals are just too rare here. When he returned home and started comparing his pictures with other images, Val realized it was indeed the rare ( for this area) Boreal owl. ← Images of Tankers and Animals at Race Rocks.